Join us as we celebrate the accession to the Berklee Archives of the personal collection of saxophonist David Liebman. The collection will house published and unpublished manuscripts, recordings, photographs, and memorabilia such as concert posters, scrapbooks, reviews, and even set lists. 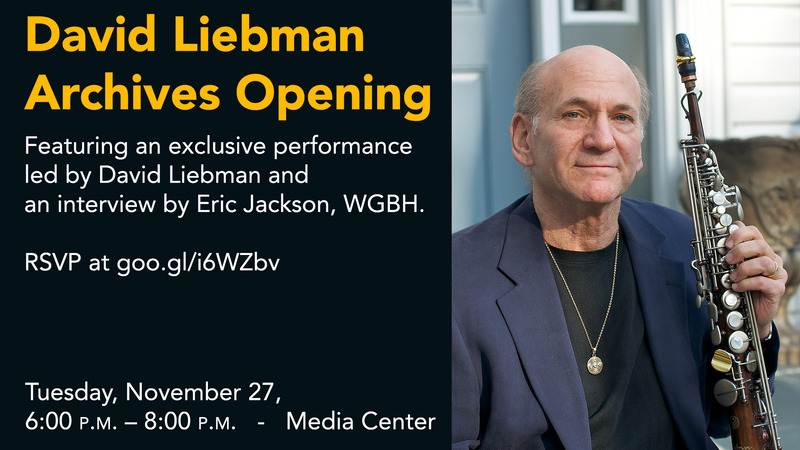 The program will feature an introduction to the collection and an interview with Liebman by Eric Jackson of WGBH. It will conclude with an exclusive celebratory performance featuring Liebman (saxophone), Anastassiya Petrova(piano), Vlade Guigni (drums), and James Heazlewood-Dale (bass). Liebman, an NEA Jazz Master (2011), has a career that has spanned nearly five decades, beginning in the early 1970s as the saxophone/flautist in the Elvin Jones and Miles Davis Groups, and continuing as a bandleader since. He has played on more than 500 recordings, with nearly 200 under his leadership and coleadership. The Berklee Archives documents Berklee’s history, activities, and contributions, with additional special collections in jazz and popular music. Areas of emphasis include the Schillinger System of Musical Composition and the history of jazz in Boston, Massachusetts. Open to the Public Please RSVP below.